Grew Up… in a relatively modest, middle-class existence, though he’s associated with the East Coast elite for his entire life. Tom has been to boarding school, where he met many of the figures that led him to disapprove of the bourgeoisie so vehemently. Visiting… Manhattan and his family for Christmas break. While back home from Princeton, Tom accepted an invitation to a debutante ball at the Plaza Hotel, where he made the acquaintance of a tight-knit group of friends known as the “Sally Fowler set." Relationship Status… pining after his ex-girlfriend, Serena Slocumb. It turns out a couple of girls in the Sally Fowler set went to boarding school with Serena. It is from them that Tom learns of the many boyfriends she had concurrently with him. Meanwhile, the innocent Audrey, one of Tom’s new friends in the Fowler clique, has developed a severe crush on him. Challenge… getting over his pseudo left-wing snobbery and learning to see his romantic life more clearly. Tom still wants to woo the mercurial Serena, despite the interest that the sweet, kind Audrey has been showing him. Personality… idealistic, arrogant, and melancholy. Tom does not understand the power he holds over Audrey. If he doesn’t act carefully, the oblivious Tom could end up breaking her heart. The fact that he'd be doing it to chase a woman who obviously doesn't care that much about him would make it that much worse. Tom Townsend's popularity ranking on CharacTour is #4615 out of 5,000+ characters. See our top-ranked characters and read their profiles. 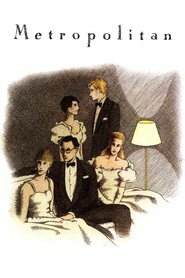 A sparkling comedic chronicle of a middle-class young man’s romantic misadventures among New York City’s debutante society. Stillman’s deft, literate dialogue and hilariously highbrow observations earned this debut film an Academy Award nomination for Best Original Screenplay. Alongside the wit and sophistication, though, lies a tender tale of adolescent anxiety.